Over the past two decades, business owners and consumers alike have increased their investment in “green” methods of cleaning. Due to the notion that “going green” is highly important for our environment, this type of service has become a desirable pursuit. Unfortunately, some business owners have also misrepresented the true meaning of what “green cleaning” is to their consumers, causing some inconsistencies in the understanding of the term. In general, when consumers ask about “green cleaning services,” they want to know what type of cleaning compounds are in use, and how they could potentially affect the environment upon disposal. WHAT MAKES GREEN CLEANING IMPORTANT? Every year, there are between 2,000 and 2,500 applications for new chemical compounds to go into usage. These chemicals go on to be used in pesticides, laundry detergents, or even items used to store or wrap food products – the data does not always indicate where these chemicals are intended for use. Part of the concern about the use of synthetic chemical compounds is health-related. Many chemicals are directly tied to causing harmful diseases, including many types of cancer. Another large concern is the effect chemicals have on the environment, both during production and during disposal. IS CARPET CLEANING ALWAYS A GREEN PROCESS? Not necessarily. All cleaning companies use different compounds or processes. 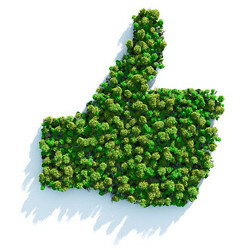 In fact, the majority of businesses employ methods that are less than environmentally friendly. Chemical and synthetic compounds are some of the most common cleaning products with large-scale carpet and household cleaning companies. Typically non-green carpet cleaning includes the application of dry powders, spray-on chemicals, dry foams, and water, combined with foaming agents. These chemical compounds are applied to the surface of carpet, and left for a small period of time. Then, a standard consumer vacuum is used to remove the water, powder, and foam. Hopefully, some of the dirt and microscopic bacteria come with the chemicals. At the end of the process, however, you’re left with damp carpets, and some leftover chemicals. These chemicals are then inhaled by and in contact with any pets, children, or loved ones who live in the home. Many people react adversely to the synthetics and compounds left behind. Common side effects of chemical cleaning are headaches, congestion, and even rashes. Deep cleaning carpet, upholstery, and other household surfaces is most efficiently done when green carpet cleaning methods are utilized. Carpet steam cleaning is our answer to chemical cleaning. With steam cleaning, no harmful chemicals are used. Instead, all dirt is removed by the pressure and heat of water applied and removed from fibers. After the carpets are dried, the flooring can be treated with a natural eco-friendly enzyme. The enzyme helps break down contaminants as they come into contact with your carpeting, preventing build up. Now that you understand the difference between green steam cleaning and other less efficient processes, schedule an appointment with Alamo Steam Team to get started cleaning your carpets in an eco-friendly and super efficient manner!